Are you looking for a treat? Add a little Sopaipilla to your day! 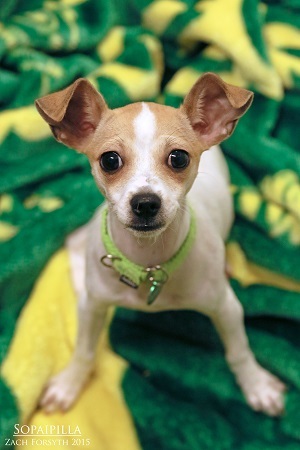 I am 5 month old Chihuahua girl who is jam packed with personality! You will be enamored with my quirky charm and delighted by all the love I have to give! I do excellently with all other animals (I even have feathered friends!) and love people to Jupiter and back. I am a youngin’ though, so training classes are a must with my adoption. I already have a head start with crate training, but still need work with potty training. Am I just the sweet you have been looking for? Fill out the adoption application so we can schedule a meet and greet. I am fixed, vaccinated and microchipped. My adoption fee is $250. I am currently living in foster care.